Exploratory Testing – Thinking at your best in real-time! TestPoint’s Vansah Exploratory Testing is the solution to designing tests and executing tests in real time. Unlike scripted testing, exploratory testing helps agile testers hit the right tests at the right time. Vansah is TestPoint’s solution to organisations wanting to go beyond the obvious and validate complex testing situations while capturing key information necessary for reporting and test logging. Vansah Exploratory Testing supports agile testing, keeping you ahead of the rapid development pace which comes with agile software projects. 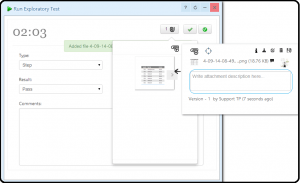 Screenshots, comments, file attachments and results are captured for each exploratory test making it easier to reproduce a problem necessary reporting and ensuring your tests are linked back to the right software build and configuration. Most organisations attempting to implement exploratory testing techniques found it came with many drawbacks where tests couldn’t be reviewed and difficult to manage which tests were performed along with the associated environment information. Furthermore customers experienced issues with exploratory testing when needing to repeat specific scenarios of earlier exploratory tests cycles. TestPoint has helped our customers take exploratory testing to a new level without the sting which is commonly experienced when organisations try to maximise the benefits of exploratory testing in agile software projects. Testers can run their exploratory tests while viewing other testers tests in real time. You can review the status of each test including any actions resulting from the testers results. While one tester is performing exploratory testing another could be collaborating on the results and creating issues against any exploratory testing. Vansah’s Exploratory Testing extends the ability to allow users to create unlimited testing or project boards (Kanban/Scrum) which could be private or shared amongst key people. Testers can paste screen shots from a clipboard captured during testing which are instantly uploaded against your exploratory testing session and shared on any board ready for collaboration and management. Your comments against the screenshots are captured as a result allowing you to assign and share your findings with developers or anyone else for that matter. Want to be agile, or just need to raise the bar? Speak to TestPoint about our solutions and great people ready to help you.